Discover some of the best art galleries, expositions and museums in Marseille with our exclusive guide. Awarded the title of Europe’s 2013 Capital of Culture, Marseille is a city teeming with cultural attractions, from art galleries and exposition spaces to museums laying out centuries of history. We’ve compiled a short list of some of the city’s best established galleries and most exciting new projects to help you get the most out of your Marseille holiday. A classic of contemporary art, one cannot describe the best museums in Marseille and leave out the Musée Cantini. Right in the very heart of the old city near the Vieux Port, the Musée Cantini offers an exceptional permanent collection by famous names such as Picasso, Matisse, and Cézanne, as well as less known artists such as Miró and Jean Dubuffet. Originally erected in 1694 as a small hotel, it didn’t see its present shape until 1936, after it was purchased and converted by Jules Cantini. Now hosting touring exhibitions in addition to its permanent collection, this museum is a central pillar in Marseille’s cultural structure. Top Tip: Visit the best patisserie in Marseille (Sylvain Depuichaffray) directly next to the museum and treat yourself to a café au lait and a pain au chocolat. One of the most impressive upcoming projects spurred on by the 2013 Capital of Culture is the MuCEM. 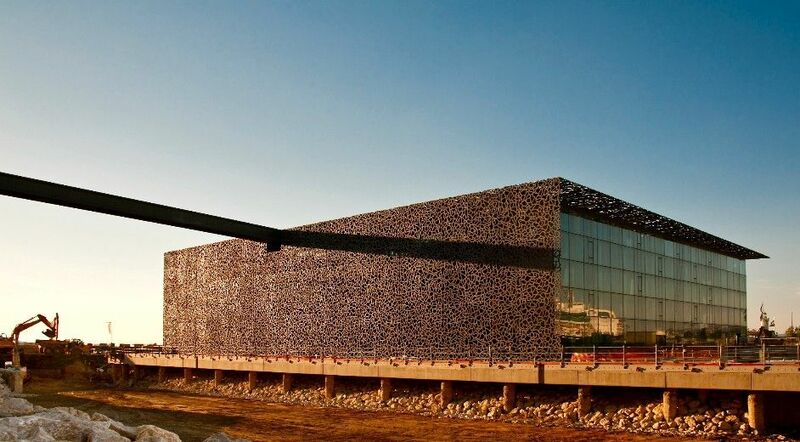 A triumvirate of new museum structures, the MuCEM comprises the ultramodern square J4 structure, connected by footbridge to the historic Fort Saint-Jean, which houses the second part of the museum. The third is the Centre for Conservation and Resources. All three facilities are scheduled to open in the Spring of 2013, presenting the first museum dedicated to the Mediterranean cultures. The revolutionary structures that house the museum marry the ancient and the avant-garde in designs by architects Rudy Ricciotti and Roland Carta. The concrete lace that frames the J4 building is already attracting enormous attention. Top Tip: Take advantage of the long opening times of the museum (until 20.00) and try to see the sunset on the walls of the building. Stunning! Another cutting-edge project coming to Marseille in 2013 is the new Regional Foundation of Contemporary Art. Based on a project conceived way back in 1982, this avant-garde structure of glass and steel will stand out strikingly in Marseille’s streets when it opens in March. The museum will house both a static collection of contemporary art from the Provence-Alpes-Côte d’Azur region as well as touring exhibitions from some of the area‘s newest artists. The modern nature of its mandate mirrors the ultramodern construction, and means this superb museum is sure to be a new highlight for the Capital of Culture. With renovations set to be completed in June 2013, the Borély museum is the quintessential image of a museum. Housed in the stunning Château Borély, which dates back to the 18th century, it promises to be an exceptional combination of old and new. Once hosting the archaeological museum of Marseille, it will now contain the superlative collection of ceramics from the Musée de la Faïence, as well as the Museum of Decorative Arts and Fashion. A ideal escape from the inner city, this museum, with its long, verdant park, will be a perfect way to beat that summer heat. Top Tip: Go for a walk in the impressive Castle Park of Musee Borely. ‘Friche,’ meaning ‘wasteland’ in English, seems a strange choice of titles; this collective arts facility is anything but a cultural wasteland. Housed in the Belle de Mai area of Marseille the Friche is a massive collection of artistic expositions, theatres, music halls, film screenings, radio, and more. Hosting a number of artists in residence and providing changing exhibitions year-round, this is the place for those on the cusp of 21st century cultural creation. Just this year, the Panorama Tower was added to the collection of spaces, a 2,400 sqm contemporary art exhibition ground, and more additions are planned for the coming months. At the Friche, you’re guaranteed to see something groundbreaking. Top Tip: Visit the skate park on the site. There are numerous, very cool graffitis and the light installation is also noteworthy. If you are brave enough on Wednesday evenings there is always a free skate course.